KISS spielen am 23. April 2015 im Independence Stadium in Belo Horizonte, Brasilien. KST Episode 3: New Year's Rockin' Eve! Der Kiss 2015 Kalender ist momentan bei Amazon UK für nur schlappe £1.99 erhältlich! KISS ARMY SPAIN IS BACK AGAIN!! After the huge success of the Kiss Spanish Cassettes, this time it is the turn of another great KISS book for collectors, written by one of its members more distinguished who after many months of research and dedication has decided to do and share this master piece of collecting world with all the fans and released through the best fan club in history: KISS ARMY SPAIN. 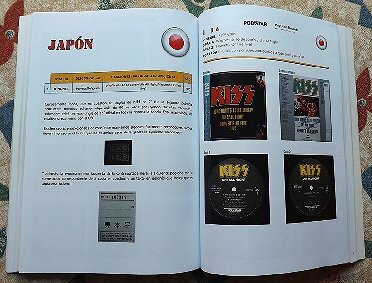 Book catalogue-type in A4 size with 144 pages, which features all the official KISS 12" maxi-singles and EPs released in all the known countries around the world during their 40 years of history. The book compiles more than 90 records from 15 countries, with more than 400 full-colour high-quality photos, including promo vinyls, test pressings, etc... The book certainly includes dates of release, serial numbers, record companies, misprints, rare data and labels with variantions. The ultimate guide for the KISS vinyl fan and the true maxi-single/EP collector. The book can be ordered in two languages: English and Spanish. The book will have great quality paper and professional finished. It will be made in a very limited edition. You can pay by Paypal to the following address: mamenyjavier@telefonica.net and then send e-mail to: web@kissarmyspain.es with your name and address and language chosen of your copy and the receipt or copy of your payment enclosed. All the books will be shipped late January/beginning of February. Price is 30 euros + 15 euros registered mail within Europe. In der Silversternacht zwischen 3:14 und 4:45 Uhr ist noch einmal der Auftritt von Kiss in Rock Pop von 1980 zu sehen. KISS spielen am 12. April 2015 im Bicentenario Park in Quito, Ecuador. Die neue Best of Kiss 40 CD (mit Bonus Track) ist nun auch bei Amazon USA vorbestellbar. Bei CD Japan ist sie jedoch günstiger. Rock Hard (1/2015): Jan Jaedike sticht mit Gene Simmons, Paul Stanley und der KISS KRUISE in See. KISS Releases New Memoir, OUT ON THE STREETS: THE TRUE TALES OF LIFE ON THE ROAD WITH THE HOTTEST BAND IN THE LAND... KISS! ZDF Kultur wiederholt "Vorsicht Musik" mit dem Auftritt von Kiss ("I love it loud"), und zwar am 15.12., 16.12. sowie am 17.12.2014. Infos dazu hier. Bei Amazon kann man nun einen Blick ins Buch "Kiss on Tour 1998 - 2014" machen. Auf jeden Fall sehr interessant und sehenswert. EX KISS GUITARIST VINNIE VINCENT SAYS YES TO SWEDISH BAND IMPERA. Three Sides Of the Coin Podcast #105: Was Macy's Thanksgiving Day Parade a Spinal Tap Moment for KISS? Bei Amazon gibt es vor Weihnachten einige Artikel zum Sonderpreis. "Out on the streets" heißt das neue Buch von der original Kiss Crew. 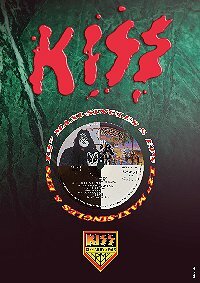 Ein neues Kiss-Buch ist erschienen: Kiss on Tour 1998 - 2014, ab sofort bei Amazon erhältlich! Kiss spielen am 10.4.2015 in Bogota, Kolumbien! Gene Simmons in "Toy Hunter - Der Spielzeugjäger"
What was Gene Simmons from Kiss doing at Leinster House today? ACE FREHLEY CONFIRMS FORTHCOMING COVER ALBUM WILL FEATURE KISS SONGS - "I BELIEVE I'M GOING TO BE DOING 'PARASITE'"
KISS RETURNING TO ARGENTINA IN 2015!